Installing Manifold was pretty easy as I had .NET already installed. After running Manifold for the first time, Manifold let me know there was an update and I had to uninstall the version I just installed and then reinstall the update. I like it when Setup applications check before installing rather than this route. That said installation was quick so it wasn’t too much of a hassle. Microsoft methods and terminology wherever a Manifold capability matches something within the Microsoft spectrum of products. 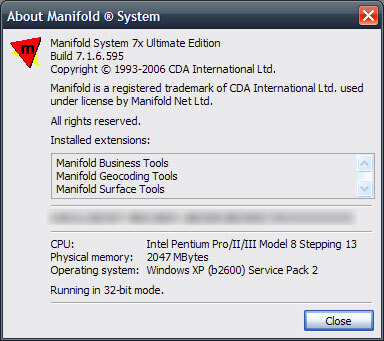 For example, Manifold uses “Tools - Options” because that’s where user preferences are kept within most Microsoft products. Microsoft Visual Studio, Visual C++ and Visual Basic user interface style for development and programming. Adobe PhotoShop concepts for photographic/artistic image editing. Manifold System logic and mathematics for GIS. The potential user base for GIS is far larger than the current ESRI population, which is a very small number by mass-market Microsoft standards. Making Manifold accessible to hundreds of millions of Microsoft Office users means adopting Microsoft terminology and methods, not ESRI’s. Older GIS systems were created in a technologically less sophisticated time. Providing the full range of modern capabilities means adopting modern ways. We seriously intend to deliver a fusion of GIS, CAD, advanced database, image processing, photo editing, mathematics modeling and many other disciplines. The right user interface that works with a blend of such intense functions is a new user interface that blends the best ideas from all these disciplines and not just GIS. We realize that the above approach make transitioning to Manifold more difficult for experienced GIS people who have a lot of ESRI or MapInfo experience they would like to leverage. However, for many ESRI or MapInfo users a transition to Manifold is really their first transition into the bigger world of Microsoft standards and mass-market PC software standards. For any professional person using computers this is a necessary step and not wasted effort. I’m not going to post too much on Manifold and how it compares to GIS systems that I’m used to until I get some practice with the application. I’m used to the ESRI way, good or bad, so I just need to spend some time and work though the new concepts. Smartly Manifold has a whole help section devoted to the “Experienced GIS User” which goes over the differences between the two products. I’ll find some time tomorrow to really get into Manifold before trying some more complex tasks.